Senior Ben Lasky takes the ball up the field. Staff Photo: Bella Scola. 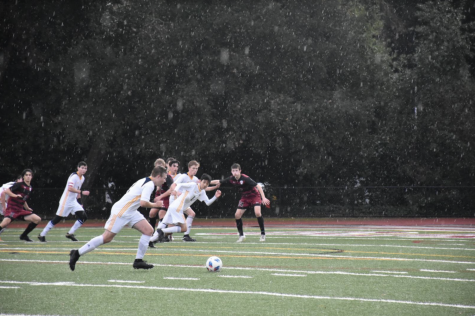 The first of the three games was the varsity boys soccer game, which started the rivalry at Menlo’s home field, resulting in a 0-0 tie. This was a tough match for both teams, and many amazing shots were saved by both goalies. 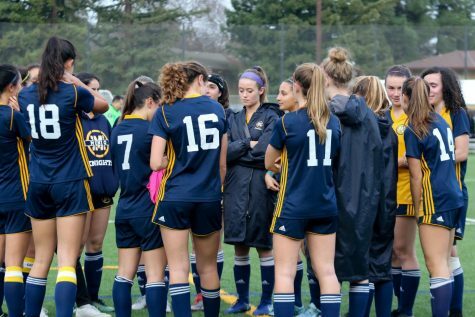 With a loss in their previous game against Sacred Heart, the Knights came onto the field with energy, ready to make a comeback. 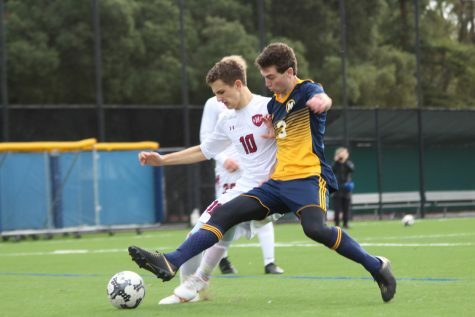 In the first half, senior Ben Lasky bicycle-kicked the ball into the lower left corner of the net, but the SHP goalie, Jacob Anderson, made a diving save to keep the score at 0-0. 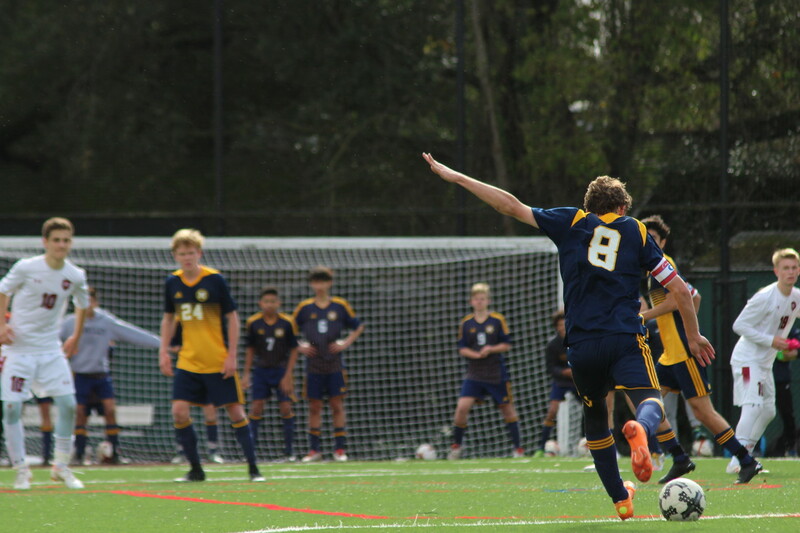 Towards the end of the second half, senior Jonathan Ebrahimian had an amazing shot to the lower left corner of the goal, but again, the Sacred Heart goalie made a quick save. After these two close shots the Knights were eager to break the tie but fell short of it. 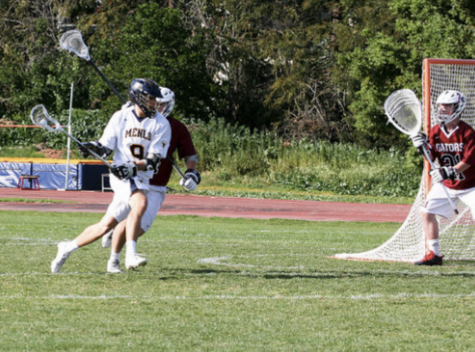 Although the teams were tied on the scoreboard, the Knights dominated the field and took the lead in the statistics. 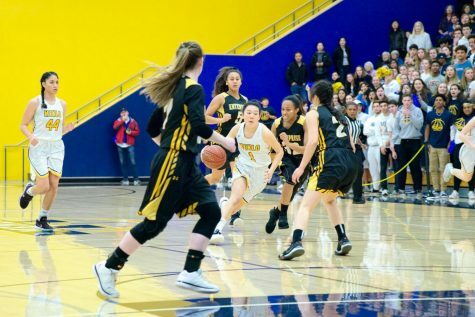 Throughout the whole game, Menlo took 21 shots, while Sacred Heart only took 7. 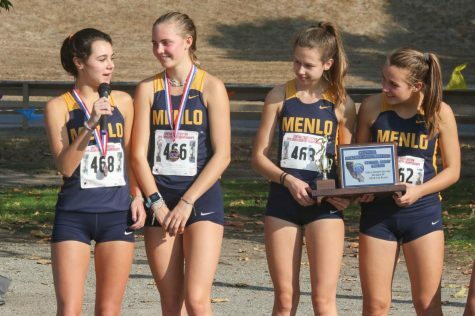 Menlo also had 422 passes, while SHP only had 360. Junior goalie Adam Kasser also had 4 amazing saves by the end of the match. Senior Max Colowick steals the ball. Staff Photo: Bella Scola. 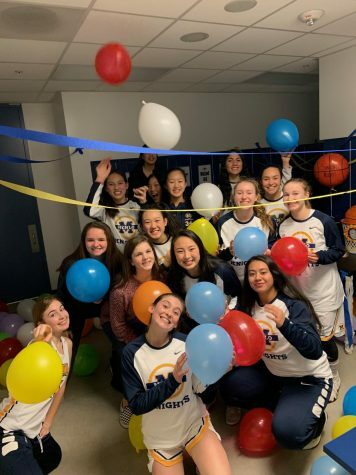 Following boys soccer was varsity girls basketball, resulting in a 57-48 win over SHP. The Knights came out with high energy, eager to defend their previous victory over the Gators at home. Both teams came out strong in a tight first quarter, but the Knights lead in points 17-15. 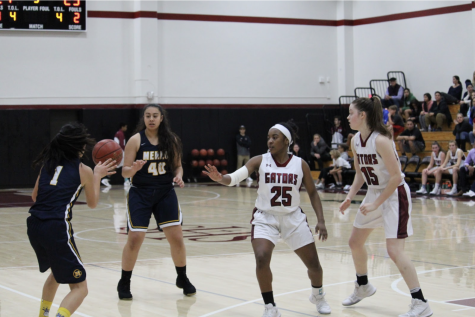 However, the Menlo girls had a slower second quarter, falling short in points and giving up their lead, the halftime score being 24-26. 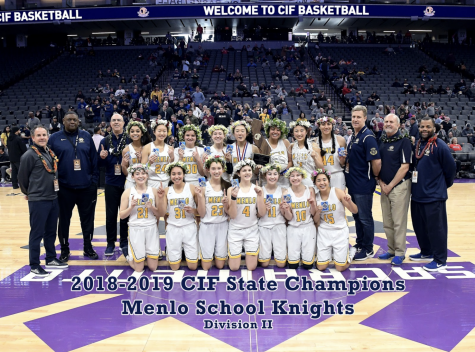 The Knights quickly turned it around in the third and fourth quarters, outscoring Prep and securing their 57-48 victory. 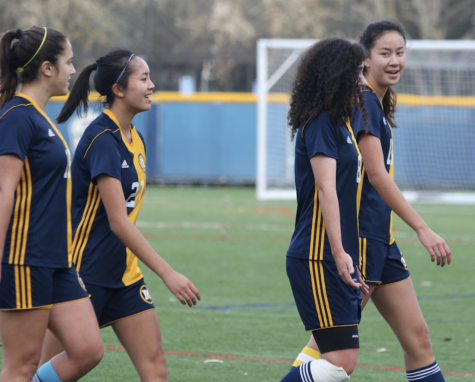 The varsity girls team has a strong, young roster. Freshman Sharon Nejad lead the team in rebounds with 13. Nejad also tallied 17 points, following sophomore Avery Lee who lead the team in points with 18. The Knights prepare to shoot. Staff Photo: Bella Scola. 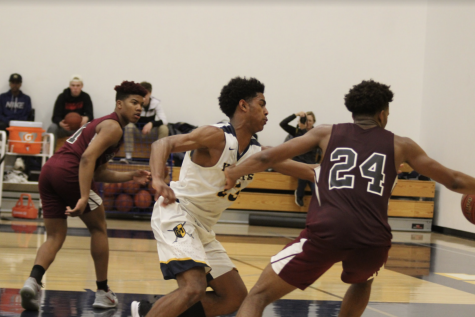 In the last of the three rival games, varsity boys basketball played at SHP, seeking redemption for their previous overtime-loss against prep at home. However, the Knights fell short in another close game, resulting in a 60-55 loss. SHP led the first quarter with 16 points, the Knights tallying 12. 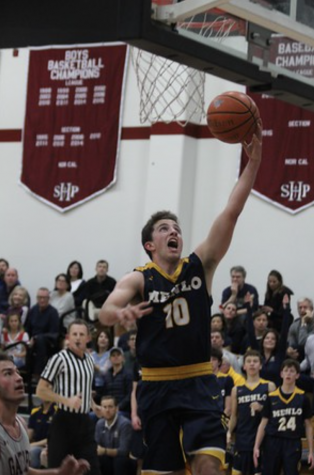 The Menlo boys came out stronger in the second quarter, outscoring prep 16-13, however it was not enough to take lead of the game. At halftime, SHP secured a one point lead, resulting in a 29-28 score going into the second half. The Knights had a slow performance in the third quarter, as prep outscored them 12-5, putting the game score at 41-33. In the fourth quarter, both teams competed with high energy, the Knights eager to overcome their point deficit. With under two minutes left in the game, senior Matt Flower swished a three-pointer, edging the game score to a tight 54-52, prep still leading. SHP followed up with a basket. Junior Justin Sellers then tallied two points, bringing back the two-point deficit. The game continued with exciting back-and-forth plays. 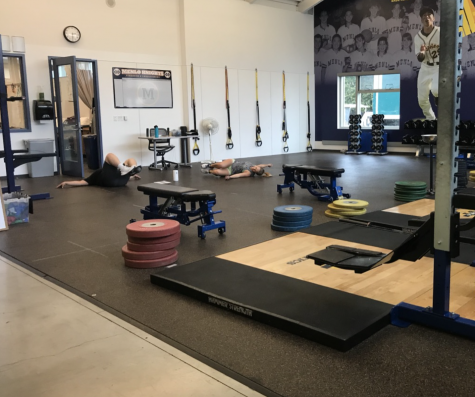 Despite having high energy and outscoring prep in the fourth quarter 22-19, the Knights ultimately fell in a close 60-55 loss. Senior Miles Dorosin shoots a lay up. Staff Photo: Bella Scola.